Pierce Brosnan makes his final appearance as James Bond in the 20th entry in the 007 series with Die Another Day. Directed by Lee Tamahori, Die Another Day marks a few milestones in the 007 film series. Not only is it Brosnan’s swan song, but it also marks the 20th film in the official EON series AND the 40th anniversary of the Bond film series that started way back in 1962. These landmarks don’t go unnoticed in Die Another Day, where the film eagerly tips its hat to its history and fans. Meanwhile, there’s an adventure for Bond to go on. After being sold out by a traitor in MI6, Bond spends sixteen months in a South Korean prison. After being released Bond plans to find out who exactly this traitor is, but M decides to revoke his double-O status. Do you think that will really stop Bond? Bond meets Gustav Graves, a mysterious entrepreneur who made a fortune after having discovered a diamond mine, but it could be he’s up to more than it seems. Before Bond or us know it, he’s traveling to Iceland and Havana, fighting a diamond scarred henchmen, trading quips with Madonna, driving an invisible car, wind surfing gigantic waves, staying in ice palaces, avoiding huge lazer beams and making out with Halle Berry. There’s much to talk about here and a lot of questions to be asked. Did the 40th anniversary of the Bond film series warrant a chorus line of shout-outs and nods? Is there a place for CGI stunt sequences in a Bond film? Why did the mainstream media automatically crown Halle Berry as one of the best Bond girls ever – even before anyone saw the film? Did her character Jinx distinguish herself enough for her own once rumored solo movie? Did all us Bond fans miss out on a great spin-off series??? Had he gotten his way, what would have been the reaction had Tamahori’s gotten to answer the often discussed ‘James Bond as a Code Name Question’ – that every Bond actor in the series were not playing the same character, but were in fact different people only using the name ‘James Bond’. How would that have gone over with 007 fans? Would the beginning of another popular spy film series that began a few months prior to Die Another Day’s release affect the future of Bond? Would Jason Bourne change the expectations of what fans wanted to see in the spy genre – even in a 007 movie? There are so many questions. Much more than just talking about whether an invisible car was a smart idea or not. I take an epic look at the 20th Bond film Die Another Day. A film that every Bond fan remembers all too well. And the one film that most fans of my 007 review series seemed to be very anxious to hear my take on. That’s one thing you have to give it – it’s certainly memorable. *sigh* No comment, seriously no comment. Liked and agreed with your video though. I didn't think it would be possible for Bond to sink lower than "Moonraker" or "A View to a Kill" but "Die Another Day" blows away both on the Suckiness meter. 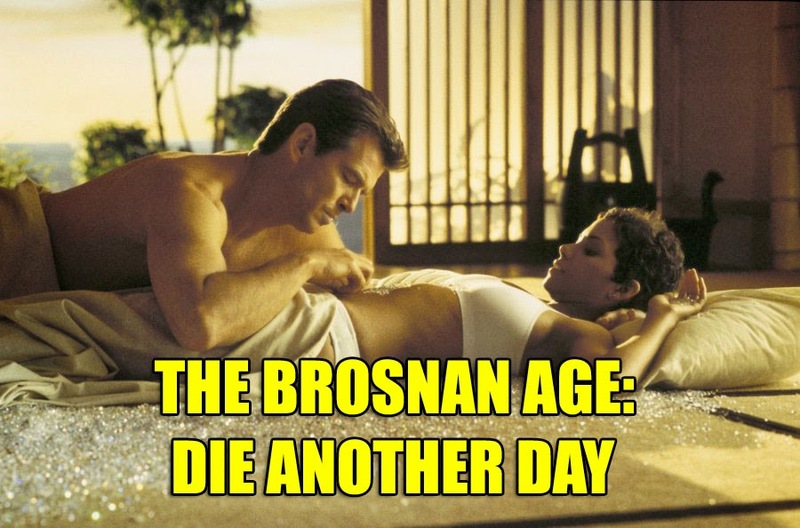 Brosnan was in my opinion a disaster as Bond- just a less-funny version of Roger Moore. Dalton should have stayed in the role. I think the video illustrates how all the compromises to get Bond back in the mainstream finally caught up with it. The stunt castings, the OTT set pieces, and the light character moments to suckered you in to believing you are watching a "deeper" Bond. All came to a head with this Bond outing. People finally called it our for what it was. And change finally became necessary. In a sense, The Boz was a victim of those choices. He got Bond back in the mainstream. But his legacy will be the vapid attention getier who was the precursor to the "real" Bond by Daniel Craig. Totally agree with Capt. Nemo's comment. But, like John Jamele mentioned, Brrosnan was a disaster. A friend of mine told me that his performance of Bond is akin to a used car salesman. Love your reviews. Especially this one. Great job. Just fyi…The "Ice Palace Exterior" in Iceland is meant to be a homage to the "evil lair / aqua-headquarters" in "The Spy Who Loved Me". They have a similar design, with the lines of architecture / construction. Plus the angles in which they are photographed and presented are also very close. So, at first sight, that's what the viewer is supposed to think anyway. Probably all part of that "40 yr anniversary" marketing stuff.. All it did for me, however, is remind me of a better Bond Movie.. Your editing is FANTASTIC and hilarious when creating scenes like Brosnan gunning down every other Bond, people reacting in the cinema to Die Another Day, or Craig stalking Brosnan!! I consider Goldeneye a classic Bond film.